In which we arrive in Guadalajara from Sayulita and Erik finds his pair of beautiful leather boots within hours of landing. They were $80, and they are magnificent. But, oh, we found so much more! We stayed at this Beautiful old hotel right in the center of historic district - it cost $21 per night! The room was a bit run down, but it had floor to ceiling windows with grand wooden-door shutters that opened to the street. And what an atrium! Our hosts in Sayulita told us that the St. Francis is their favorite place to stay in Guad. It is just as central, and possibly in better condition. Potentially more costly, but maybe not by much! We spent 2 nights at the Don Quixote and it was perfect for us. Our last night was the start of Semana Santa and the streets got rowdy. I was literally woken up in the middle of the night to the sound of fists hitting flesh of a fight right outside our window. Charming. We arrived in Guadalajara after a 5 hour bus ride from Sayulita by way of la Penita. It cost $20 each for the bus ride. We passed beautiful scenery, a few small towns and many fields of agave. When we took to the streets in Guadalajara we found music and dancing every where we looked in the historic district. This photo is of a symphony playing in a lovely gazebo. WE saw very few other tourists. Dance performances from different groups all clad in beautiful costumes. This market was enourmous. I am convinced that you could find anything you wanted/needed here. We walked through the jean section, found a trinket section, bought ourselves a nice handmade clay pot, and had just stumbled upon a whole wing of leather goods when we had to exit to find a bathroom. I will someday find that leather good wing again. Something we have still not tried through not only our month in Baja, but also our time in Jalisco. Centro Historico is full of beautiful plazas with old historic fortresses and cathedrals. 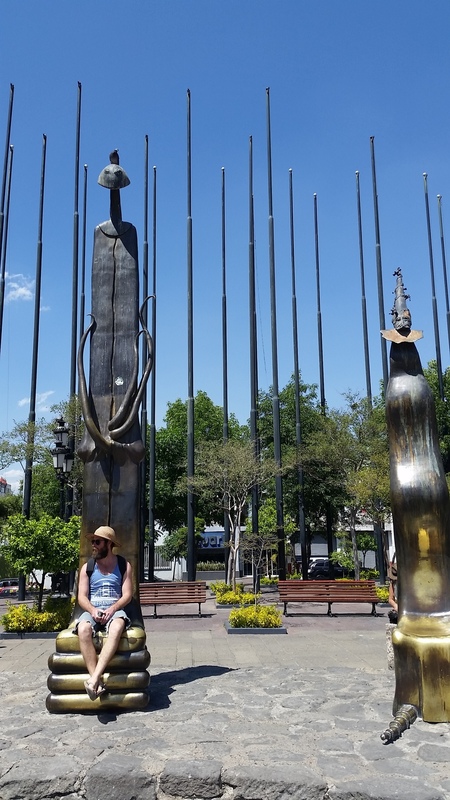 In the Plaza Tapatia we found the awesome and whimsical sculptures of Alejandro Colunga. Very hot to the touch on this hot day, but so cool to stumble upon! We entered one of the epic fortresses which housed an art museum. The building is called the Hospicio Cabanas and it was originally built to "provide care and shelter to the disadvangtaged" -elderly, handicapped, and orphans. How cool is that? It was filled with several excellent exhibits which were each contained in several rooms connected by atriums such as this one. Really interesting stuff. For our final afternoon in Guadalajara we took a 30 minute cab ride to the Tlaquepaque, a word that we struggled to pronounce throughout our entire trip and an area that was much talked about. We found the tourists! They all seemed to bypass centro historico and head here. It was very colorful and full of places to buy fine artisan goods. I am sure that if we had had more time we could have looked deeper and found the deals. But, we skimmed the surface and found many a street lined with bars and an excellent home and garden store. The building here were very old, and art abounded. These umbrellas are an art installation that gives much needed shade to this lovely street. We foolishly went to a bar and had a beer before we realized that tequila tastings are complimentary in the tequila stores around this town. We tried several varieties including creme, which is creamy tequila. Like Bailey's Irish Cream but with tequila. Oddly delicious. They also had this mirror for sale. Plus all of these crosses. At the end of our day in Tlaquepaque we found the largest bar in all of Mexico. Well, really the largest restaurant, where we found what seemed like the smallest bar in all of Mexico. It was really the service bar for the restaurant, but we saddled up. The 2nd bartender pointed out that we had also found Erik's Mexican doppleganger. We later moved into the restaurant where we not only saw several mariachi bands playing to several dinner parties, but also an indigenous dance performance broke out in the central gazeba. A great ending to a great day. After an interesting nights sleep interrupted by fist fights in the street. We woke up at 6am to catch the 5 hour bus back to Puerto Vallarta to grab our 3.5 hour direct flight back to SF. Just in time for dinner. These are the photos with which we re-entered the states. Seems like a way longer trip than 6 days, but 6 days did us just right. In conclusion, go to Guadalajara. It is awesome! Some of the photos have links, so click them! And learn more. Also, tell me what you think below, about my thoughts on guadalajara!